Accounting Basics 1: Where did Accounting Come From? 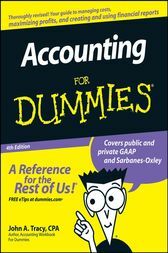 Financial Accounting ACG2021 SFCC Spring 2008 Chapter 1. In this chapter, Professor Susan Crosson teaches accounting basics, and in particular, introduces the Accounting Equation. Part 2 of 7. Financial Accounting ACG2021 Spring 2008 Chapter 1. In this chapter, Professor Susan Crosson teaches accounting basics, and in particular, introduces the concept of Assets. Part 3 of 7. Financial Accounting ACG2021 Spring 2008 Chapter 1. In this chapter, Professor Susan Crosson teaches accounting basics, and in particular, introduces the concept of Liabilities. Part 4 of 7.